No gift for your coworkers yet? Don’t worry, it’s never too late to buy a cheap piece of plastic just dripping with cynicism and call it a “gift.” If you’re still reading, you have the right sense of humor to appreciate the office gift ideas, below. The Cubes is a very popular line of toy figures that mock the modern day workplace. Every few months, the Cubes are forced to listen to Tom, the motivational speaker. Will he boost their morale and make them better employees? Will he make them participate in a role playing exercise? Because we have all been in the office that is unnecessarily cold. Prevent the torture of the up-down-up-down thermostat. Let the cold people wear warming gloves and the overheated people can get desk-sized fans. These Origami Sticky Notes provide something fun for those dull moments at the office. You can now recycle your old sticky notes and turn them in to paper 3-D models. Each pad has printed instructions on each sheet for 10 different origami shapes. 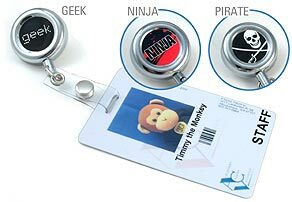 If you have to wear an identity badge all day at least you can now make it a little different with these cool badge holders, are you a geek, ninja or pirate? Three-dimensional wit for the desktop and a delightful way to hold down papers. Tibor Kalman’s typically clever style is evident in this rigid silk-screened vinyl paperweight, hand-crumpled and wrapped around a steel weight. A civilized way for visitors to announce their arrival at your cubicle entrance. Install a Cubicaller and eliminate the need to knock loudly, kick a coworkers garbage can, tap their shoulder, flick their ear, shuffle your feet or any other disturbance used to let your coworker know you need their attention. The unique 3-way volume selector lets you set the loudness for your particular environment: Normal (for environments with average background noises); Soft (for less active environments); Personal (extra soft for very quiet environments). Is your anger in the office slowly brewing to a boil? Have you just about had it with incompetent bosses, incompetent employees, or unreasonable clients? Just reach for our Office Anger Management Kit and punch your way to serenity! The kit includes 2 giant silver inflatable boxing gloves (essential stress-relieving equipment), as well as a practical booklet on “10 Great Ways to Reduce Office Stress.” Buy a few sets and start your own Office Fight Club, or use the gloves as an office pillow – the choice is yours. This hilarious desktop sign kit contains 30 different signs designed for office use. Each sign contains a humorous saying that will get your message across. If you’re rather busy in the morning you may want to start the day off with the following message: “I’m busy now, can I ignore you some other time?” The spiral bound roledex style sign catalog is easily updated to the next message. When it’s getting to be late afternoon and your starting to drag a bit, you may want to flip to “Leave Me Alone. I’m not being rude, you’re just insignificant”. The set features many more great sayings and will add a little levity to your workplace. Make an instant impression and spice up boring office memos with this set of four abusive stamps. Each comes with its own red-ink pad for maximum effect on paper. These Abusive Stamps are sure to add humor to your office. This bright red, actual computer key is imprinted with the word “PANIC”. Adhesive backing allows you to attach this novelty computer key to any object that brings you frustration. The set also includes the Any Key Button. Has your computer screen ever told you, “Push Any Key To Continue”? You searched and searched, but just couldn’t find that elusive ANY KEY. Well…here it is. he dutifully endures pitfalls and hazards in the name of public safety.